Gallery owner Diane Stewart conceived Art Behind the Zion Curtain as a challenge to artists with local ties to reflect on Utah’s social, political, and cultural issues. Fourteen painters, sculptors, and photographers responded with pieces on view at Modern West Fine Art through May 13. The works are as varied as Utah’s environment, running the gamut from comedy to serious reflection on political and social issues. Whether visitors are new to the state or informed and opinionated about local controversies, they will find the exhibition a refreshing push for artists to engage with Utah and its shifting place in history. 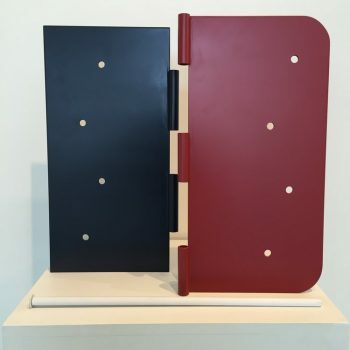 One of the first pieces on display as one enters the gallery is a sculpture by John Vehar-Evanoff, (who is more widely known as a painter), done in collaboration with Casey Loter. “Unhinged” is three pieces of painted metal: a white pin, lying in front of two upright, separated sides of a door hinge. One side painted red and the other blue, the piece is a straightforward observation about the widening gap between the country’s two major political parties, which is especially noticeable in GOP-dominant Utah. The sculpture’s focus on Utah’s political realm is shared with pieces by Kevin Kehoe, Ben Steele, Jody Plant and Nathan Florence, who use their personal style to comment subtly or brazenly on current or historical politics. 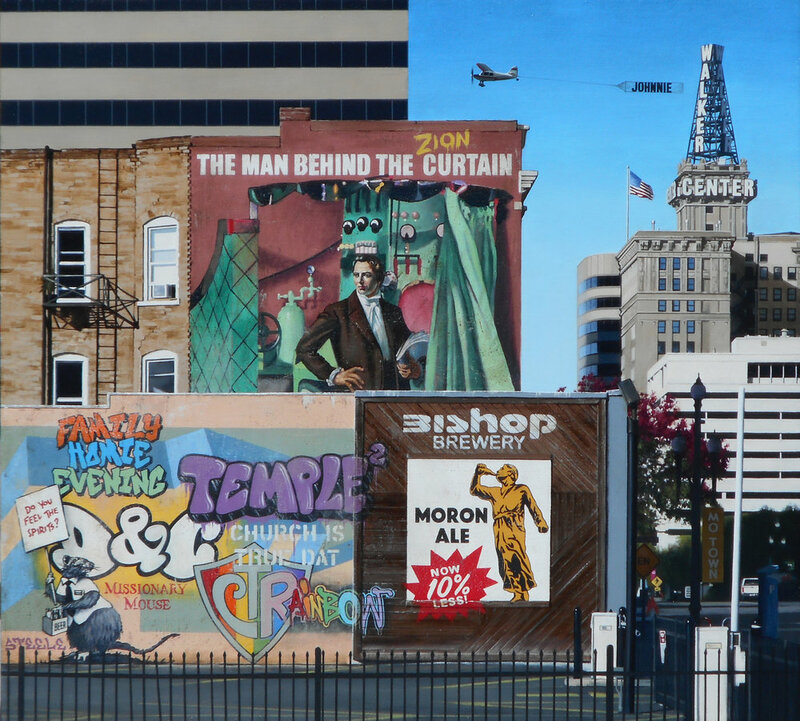 The namesake of the show, Ben Steele’s “The Man Behind the Zion Curtain,” features the artist’s signature media-bending painting techniques (see here), with the LDS-branded terms “CTR” and “Family Home Evening” graffitied in neon, balloon letters on a brick wall in the foreground. The work also sticks to Steele’s standard practice by pulling from the world of advertising and popular literature: a portrait of Joseph Smith emerges from L. Frank Baum’s classic green curtain, where the Wizard of Oz ruled over a population hoodwinked by tricks and trappings that made him appear infallible. The poster for “Moron Ale,” in which the statue of the Angel Moroni should ostensibly create an “i” but doesn’t, references the state’s ever-changing and often-criticized liquor legislation. Where Steele pulls controversy out of the shadows and plasters it boldly onto the very buildings of downtown Salt Lake City, Kehoe prefers to use understated images for his commentaries. Kehoe’s “West End” looks at the topic of Utah’s liquor issues, a running motif in the exhibition. This year alone, two controversial bills, HB442 and HB155, have put Utah’s tight regulation of liquor sales and consumption in the national spotlight. The first bill provides Utah restaurants with liquor licenses an option to replace their “Zion curtains” — the 7-foot barriers that prevent people from seeing alcoholic beverages being prepared — with a 42-inch half wall that separates bars and dining areas, or a 10-foot buffer space. This seeming “loosening” of restrictions is counterweighted by HB155, which reduces the legal blood-alcohol content for drivers to the lowest in the nation—.05 percent. 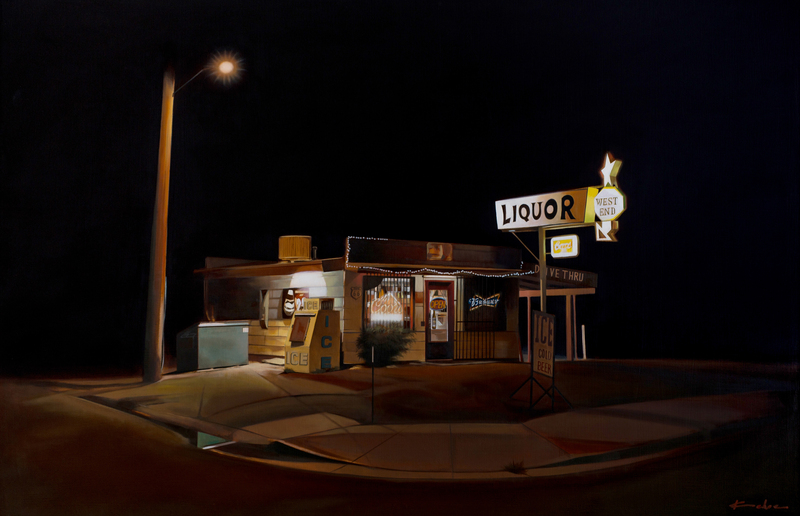 In response, Kehoe has created a softly glowing painting of a liquor store at night—strikingly reminiscent of Edward Hopper’s work of the 1940s. The closed shop’s isolated position in the middle of an otherwise-unoccupied canvas speaks to the state’s liquor legislation’s alienating effect on those who do or do not consume alcohol, as well as the economic effects. The ramshackle look of the painting’s store seems to be a reference to the recent legislation’s extra burden on businesses, which potentially shuts down sources of economic growth in the state’s commercial and tourism sectors. Additionally, putting tight controls on beer, wine, and spirits (wittingly or not) creates a barrier not only between people and alcohol, but between different populations living in the same state. Kehoe’s image is simple, but references complex issues that have far-reaching effects inside Utah. In January 2017, Salt Lake City registered as having the worst quality of air in the country, according to the Environmental Protection Agency’s AirNow.gov, so it seems fitting Nathan Florence and Jody Plant chose to create works that speak to environmental concerns. 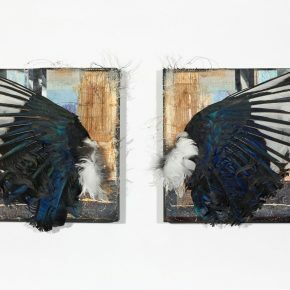 Plant’s mixed-media piece “Broken Sky,” on two small canvases, features two black-and-white wings facing outward, mounted and separate from their source of flight. Florence’s “The Zion Curtain Inversion” also combines media to portray the soupy inversion that frequently clouds Salt Lake Valley skies in the autumn and winter. 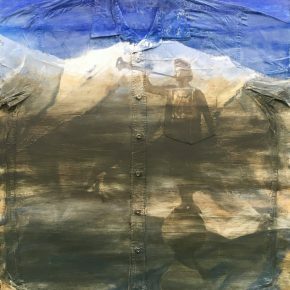 His piece features a button-down shirt (a recognizable piece of LDS missionary uniform) pasted to a canvas, with gray, light brown, and white paint partially obscuring a dingy-looking Angel Moroni statue. The usually gleaming symbol of the LDS Church surrounded by haze seems a rebuke to a government that consists largely of members of The Church of Jesus Christ of Latter-day Saints but has yet to propose significant legislative action to combat the deadly air quality problem. Far from being an all-serious tour of Utah’s problems, Art Behind the Zion Curtainfeatures several artists who use the opportunity to celebrate the beauty of Utah or poke fun at the prevalent problems with which the state struggles. Woody Shepherd’s “Autumn Aspens” is a vibrant explosion of color that could be at home in a variety of exhibitions, though in the context of this one the aspens begin to resemble a fence or wall. 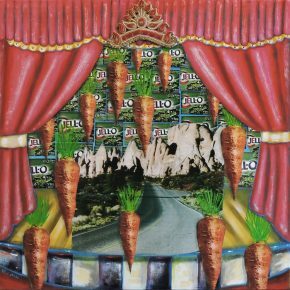 Dave Newman’s mixed-media collage celebrates some popular Utah icons: redrocks, Jell-Os and carrots. And “Two Utes on a Unicycle,” by Frank Buffalo Hyde, shows a circus-like scene of two Utes wheeling against a flowered background. The embrace of comedy can be read as an empowering statement against always focusing on the negative or contentious parts of society. While Utahns are divided by political identities, questions about how to safeguard human health and the environment and even something as seemingly trivial as our beverage choices, art can help create a forum where people can reasonably discuss shared goals and how to shape the future. Art Behind the Zion Curtain is at Modern West Fine Art in Salt Lake City through May 13, 2017.